Felts, crayons, paint, stickers etc. Wooden beads, sea shells, bells etc. Help your children to decorate the outside of the plates (don’t forget to write their names on!). Fold the plate in half (like an empanada) and staple along the edges. Leave a gap at the top. Hold it upright with the gap at the top. Help your children to drop beads, bells, shells etc. inside their musical instrument; one big toddler sized handful will be about enough. Staple up the gap, put on some music, and shake! Note: This is a great activity to do on a rainy day or with a playgroup. For younger toddlers choose larger items to put inside and play with under supervision only; i.e. keep choking hazards in mind. Using your ruler and chalk, draw a pattern on the felt. You need the crown / tiara + two rectangles for straps. The straps bed to be long enough to tie at the back of your child’s head. Let your child choose decorations for their crown. You can choose whether to handsew buttons on (stronger) or hot glue gun them. Sprinkle on done rainbow glitter for extra magic! (The glitter will stick to the felt, at least for a while). Sew the straps on each side. You can either use a needle or a sewing machine. Beautiful crown ready to wear! A wonderful winter activity can be going for a walk through the woods or local park and talking about how the trees change with the seasons (and how some don’t!). Collect some leaves and pine cones on your walk and take them home to dry. Tip: Putting then on newspaper or a towel in the hot water cupboard works well. 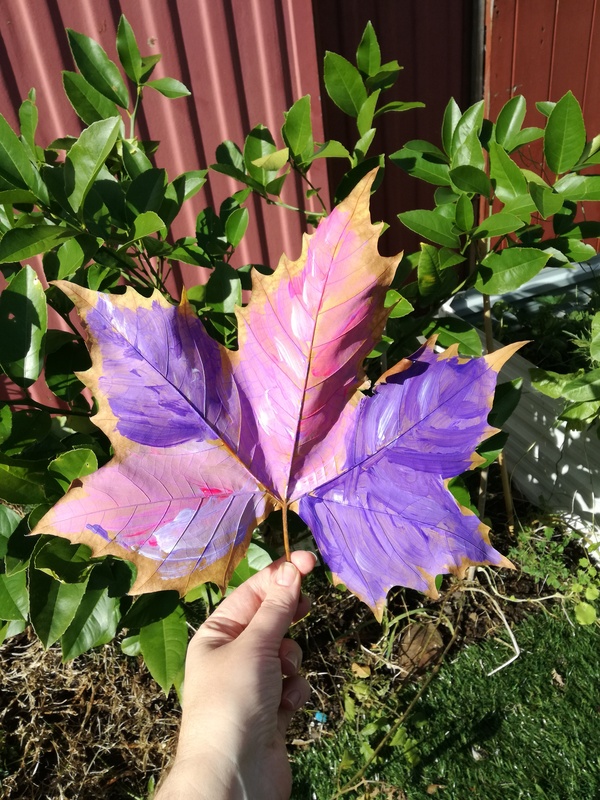 Once the leaves are dry they make a wonderful canvas for painting. Again, they dry well in the hot water cupboard and can be hung up for a few days as decorations. Tip: You could try spraying them with varnish to help them last longer. Today we went and explored a beautiful secret garden after Miss 2’s post-op Doctor’s appointment. I’m still working my way up to talking about our experiences with her multiple surgeries and instead thought I’d share a glimpse of the beautiful landscapes we saw. She won’t leave the house without him!